Most babies love bath time. There are a few secrets to making a baby bath even more enjoyable for your little one. The first few times can be a bit frightening but you can help put baby at ease while keeping him safe. There are two important safety tips about the bath. 1. Never, ever leave your baby unattended in the bath. 2. Get everything you might need gathered together at the bath area ahead of time…then, there’s no need to break rule #1. 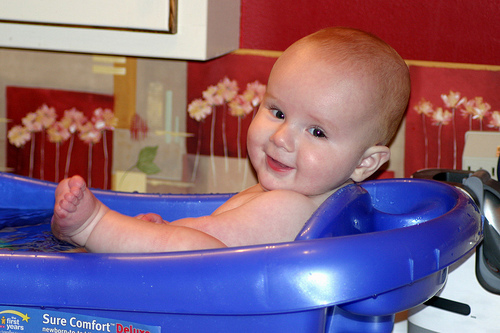 When is Baby Ready for the Big Bathtub?